For best results, place the Network Extender in an elevated location near a window then position the GPS antenna horizontally (GPS letters facing up). Refer to the Quick Start Guide for wall mount instructions. 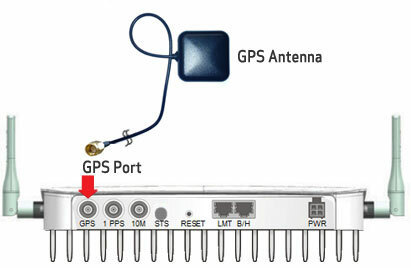 From the connection side of the Network Extender, attach the GPS antenna cable (indoor use only) to the GPS port (mini-coax). Do not force the cable into the mini-coax connector as this may damage it.